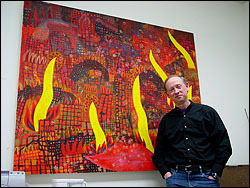 David Schirm stands against one of his paintings inspired by time spent in Sri Lanka during his first Fulbright Fellowship to the country in 1996. During the first week David Schirm, professor of art, arrived in Colombo, Sri Lanka, as a Fulbright Fellow in 1996, almost 60 people were killed and a political candidate assassinatedthe work of suicide bombers. He watched in the days following the attack as dozens of funeral processions passed by his home in the city, the grief-stricken clad in white, the traditional color of mourning. What was to be primarily an artistic and spiritual journey, inspired in part by Vedantic and Buddhist philosophy, immediately took on a much larger political and social dimension, which soon was reflected in his full-colored drawings and paintings from that time. Religion and politics, as well as temporal and spiritual concerns, suffuse Schirm's artwork. A large painting now hanging in his North Campus office captivates, then informs, without the heavy-handed posturing of so much politically inspired arta brief glance evokes giant, peony-like red flowers that are in reality buildings on fire. Haunting eyes peer from the wreckage of a burning city and an enormous pair of red lips, nearly pursed in a kiss, anchor the lower half of the painting. Small, star-like white flowers, perhaps ashes, perhaps anthuriums, the flower of mourning, waft upward through the scene. It is Colombo after the suicide attack and strangely reminiscent of a not-yet-distant attack on the World Trade Center. Schirm visited Sri Lanka and India during his first Fulbright Fellowship and next winter will make a return trip to both countriesspending a month in eachfor his second Fulbright award, accompanied by his wife and two children. He will visit sites sacred to both Hindu and Buddhist followers, undertaking two separate journeys that follow the paths of two of the greatest figures of Eastern philosophy and religionthe Hindu god Rama, hero of the Indian epic "The Ramayana," and Buddha. As part of his Fulbright application, he tells the story of how his relationship with Eastern culture began. Just before he shipped out for a tour in Vietnam, Schirm acquired a small copy of the "Bhagavad Gita" in a used bookstore in Philadelphia. "It was thin and small, only about three by four inches and one-half inch thick. Perfect for carrying in a pack or fatigue pocket. I carried it with me through that year, never opening it or knowing what was inside. It wasn't until years later that I opened the book to discover that it was about a warrior's duty. Struck by my dumbness, I couldn't imagine that a few years after that I would find myself in the Los Angeles Vedanta Center where I met Christopher Isherwood (acclaimed Anglo-American novelist and playwright, 1906-1986), who had helped translate that version. "For several years I was exposed to Vedantic and Buddhist philosophy. I was especially influenced by the ironic twists in the ancient literature that paralleled the kinds of turns that had made a direct impact on my life. However, there seemed to be little influence on my professional work," he explains. All of that changed, says Schirm, in 1983, when his work shifted into narrative storytelling through his drawings. "Since then, I have explored family history, my war and social, religious or political themes." In a symbolic gesture and to represent bringing the two divergent paths together, Schirm will present a small Buddha to the Isipathanaramaya Buddhist temple in Sri Lanka and an image of Rama to the Kathiresan Kovil, also in Sri Lanka. "The images will have traveled together as companions, similar to their historic relationship but without the conflict that has marred their association," says Schirm. He also plans to keep written, online and photographic journals and to exhibit the resulting artwork from his journey at the Indian Kanoria Centre for the Arts, the Lionel Wendt Gallery in Sri Lanka and later, in the United States. In both countries, he will conduct workshops to help prepare art students for graduate study in the hope that the most talented artists from the host countries will be able to complete one to two years of study in the U.S. In 1995, Schirm had assisted the Institute of Aesthetics in Sri Lanka in developing a fine arts graduate degree. Contrary to what Buddhism represents in the West, art found in Buddhist temples in the East tells the story of a hell for "every miscreant possible," says Schirm, such as being eaten by leeches and pecked by birds, which hardly resonates with the watered down Buddhism, or "Buddhism-lite," now practiced by many in the U.S. There are even particular hells marked out for Sri Lankan taxi drivers, he says. His family will have a few familiar challenges to overcome, but Schirm recalls his previous journey to both countries with obvious fondness for the artisans he met and people who befriended his young family and especially his daughter, who was treated "as a little goddess" by locals. "There is the snake charmer who comes to your door with a cobra and the cobra outside in the garden ready to bite your childrenI had to go out every morning and beat the bushes to chase the cobras away" he says of one of his daily routines in Colombo. The most noticeable and striking aspect of Schirm's personality, in stark contrast to his work, is a quiet peacebearing a ready, warm smile and sense of humorand yet he is attentive and responsive to the tumultuous religious and political concerns that mark daily life in so many troubled regions of the world. He says the Sri Lankan experience continues to shape his work and teaching with memories, as well as images and metaphors, from his time there. India too, holds a similar fascination for me, more sensed than always tangible."